The following plants are simple to grow. Simply remove the seeds from the fruit, remove the flesh that surrounds the seed, and plant about an inch deep in a small, well-draining container of potting soil. 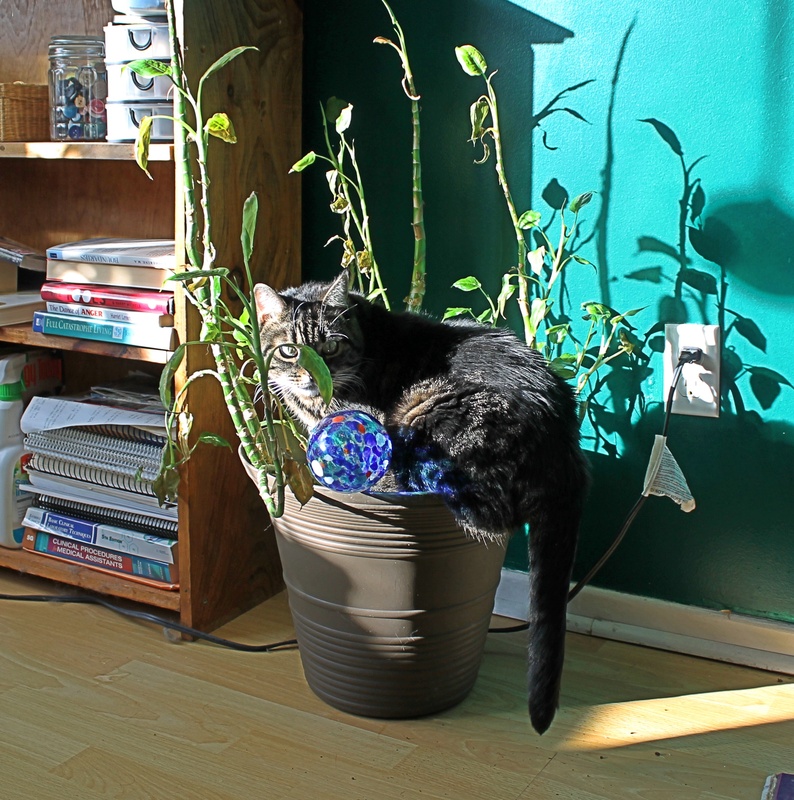 Place in a sunny spot, water regularly, and wait. You may want to plant several seeds in case one of them doesn’t germinate properly. Here we have the pomegranate seedling. As we all know, the pomegranate is becoming a very popular health food due to their high content of antioxidants. You can buy them as juice, as chocolate covered candy or even in the form of a martini as bartenders catch onto the trend. It seems like everyone loves them. So I figured, why not grow one? I planted this one several months ago and it’s still not very big. The pomegranate plant likes sunlight and it has been trapped inside all winter, so I’m hoping the warm weather will encourage it to grow. My lemon plant, on the other hand, is doing a bit better. It is growing very slowly, which I will attribute again to the fact that it is a sun-loving plant that has been wallowing in the cool darkness of my apartment all winter. I’ll post an update during the summer so we can see if the heat does anything to help it grow larger. And finally, we have the tamarillosweet granadilla plant. I found it at the super market and had no clue what it was. It is rare to find at the supermarket here in Canada, so I’m glad that I grabbed it while I could. In case you’re wondering what it looks like, here it is before I sliced it open. Here it is after it started to grow. It took a while to get started, but now that the weather is warming up it is growing very quickly! The leaves are broad, pointed and very thin with a slight fuzziness on the surface. Out of all my plants, I am the most excited about this one. I’m predicting that it will grow at least a foot taller over the course of the summer. Thanks for stopping by today. And let me know if you decide to grow some grocery store plants of your own! There are so many different kinds to experiment with that I’d like to see what other things can be grown. CORRECTION: What I thought was a tamarillo is actually a sweet granadilla. Thank you to chalvega219 for pointing it out! wow realy cool. The biggest avocado looks very pretty. This whole post is very nifty. Ill link to it next time I do a potato update. I used to live in SoCal where these plants practically grow wild…but now I’m out on the East Coast with hazardous weather conditions….is it possibly to grow lemon & Avocado trees in PA? I know it’s a little late, but that fruit isn’t a tamarillo, it’s called a sweet granadilla (passiflora ligularis) and is related to passion fruit. I’m quite jealous you found it because it’s an Andean fruit and not typically found in many places, believe me I’ve looked for it! I’d love to find some seeds of it to grow but I can’t find the actual fruit anywhere. Actual Tamarillos have a fleshy skin and taste rather different but are from the same region. Thank you for the correction; I will edit my post. I wasn’t 100% sure if I had gotten the name of it right! Where did you learn about these fruits? I have a Grinadella plant, for the past 2 years it has flowers but they fall off and do not bear any grinadellas. Hmm I’m not sure. Maybe they aren’t being pollinated.